Posted in: Closet Case, Divorce, Gay Husband, Relationships, Straight Spouse, Uncategorized. Tagged: Catholic, Contesting Divorce, Divorce, Human, Lopsided Divorce, Marriage, New Jersey, New York, No Fault Divorce, Relationships, Unfair divorce, United States. Well said:) My (now ex) husband did the whole deception/betrayal/abandonment thing. He never mentioned divorce. He just left. Leaving me to file (there was never a question in my mind that it was the right thing to do given the circumstances). It’s amazing to me how much I’ve been judged – you know, the whole, “Oh, I would never file for divorce. I would give anything to work on my marriage.” Yeah, but sometimes there’s nothing left to work on. The other stat that get thrown around a lot is that women file for divorce like 70-80% of the time. What that stat leaves out is the number of women who file after they are pretty much abandoned by their husbands. We might file, but it’s not like we went looking for the divorce. In many cases the other half really has no choice. 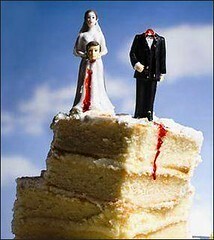 It might take two people to make a marriage but one can very easily destroy it.